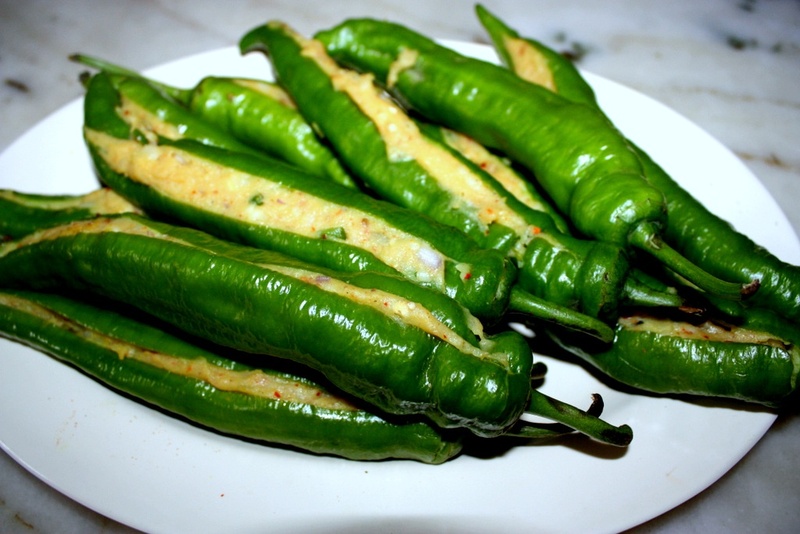 Mix the mashed potatoes, diced onions, green chillies,green coriander, red chilli powder and salt. Heat 1 tbsp oil in pan, add the cumin seeds. When the seeds crackle, switch off the heat. Add the turmeric to the oil, mix well and instantly pour the oil on the mashed potatoes. Now add the the garam masala and the lemon juice and mix well. Adjust the seasonings as per your taste. Wash and clean the chilies. Slit them in the center and remove all the seeds. Keep the stalks intact. Stuff the chillies with the potato mix and set aside. In a bowl, mix all the ingredients for the batter and gradually add water till you get a thick batter . Heat oil in a deep frying pan .To test if the oil is ready, drop a little batter if it rises immediately to the surface and sizzles, the temperature is correct. If it browns quickly it means it is too hot, in such a case,turn the heat down. If it sinks to the bottom and does not simmer it means it is not hot enough.The pakoras will absorb too much oil and remain greasy, adjust the heat accordingly. 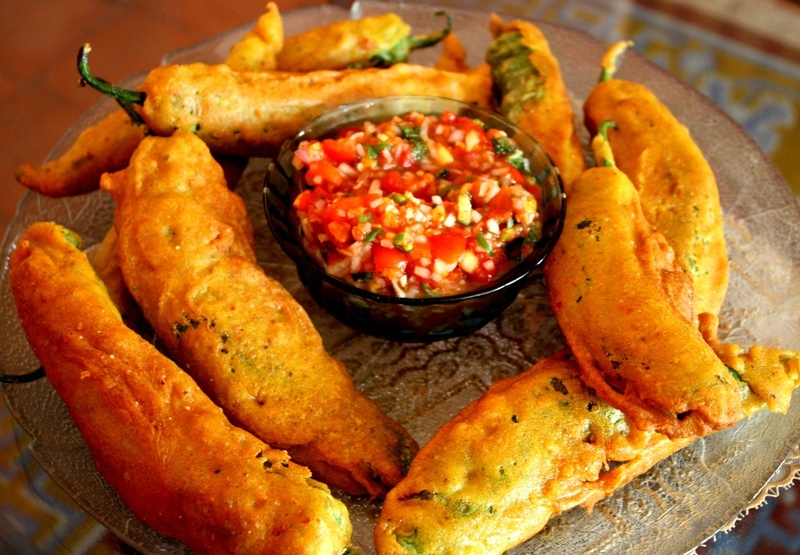 Dip the stuffed chillies in the batter and deep fry in the oil till they are golden brown.Fry over medium heat and strain on paper towels to drain the excess oil. Serve hot with tomato sauce, chutney or with Tomato Salsa. 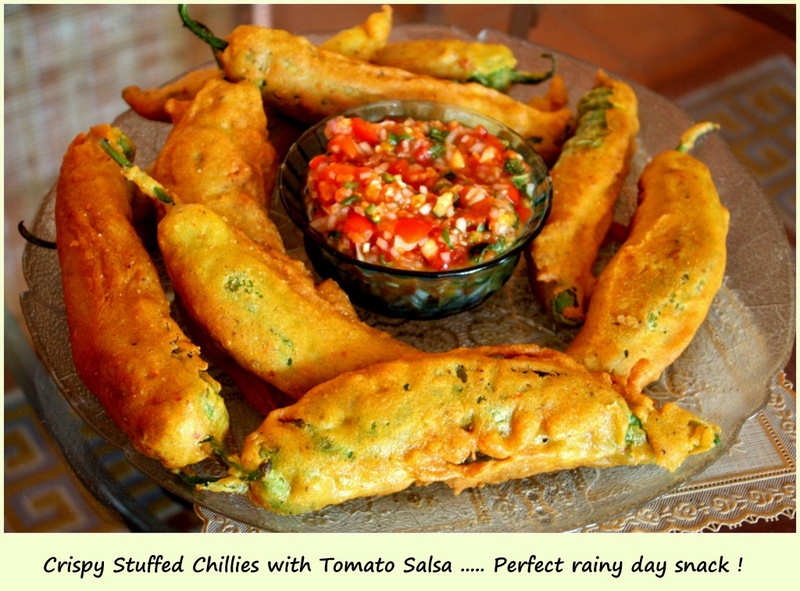 This entry was posted in Snacks & Appetizers, Vegetables and tagged Chilli Bhaji, Chilli Pakoras, Mirchi Bhaji by Kamakshi. Bookmark the permalink.